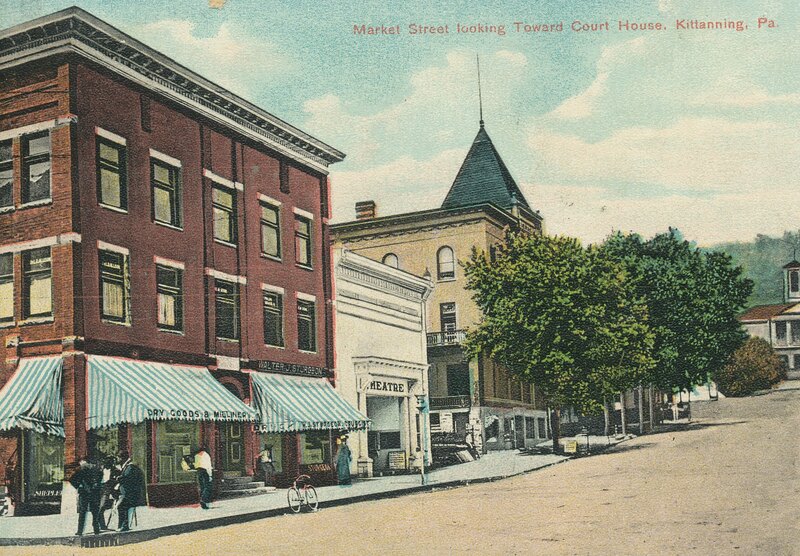 The Thompson Building at the corner of Market and N. Mckean Street has served several business over it’s 110 year history. 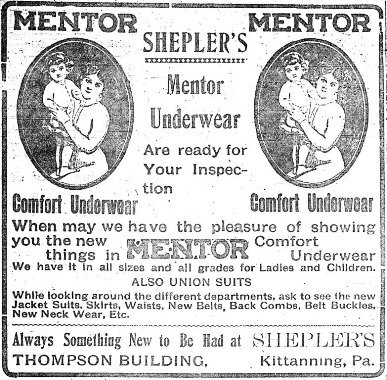 In that time era you didn’t go to malls for your shopping, but to downtown Kittanning which served all your needs. Every floor was used in those buildings with the 1st floors being used by merchants, and the remaining floors used for doctors, dentists, lawyers, dance studios, and other office purposes by the companies in the area. 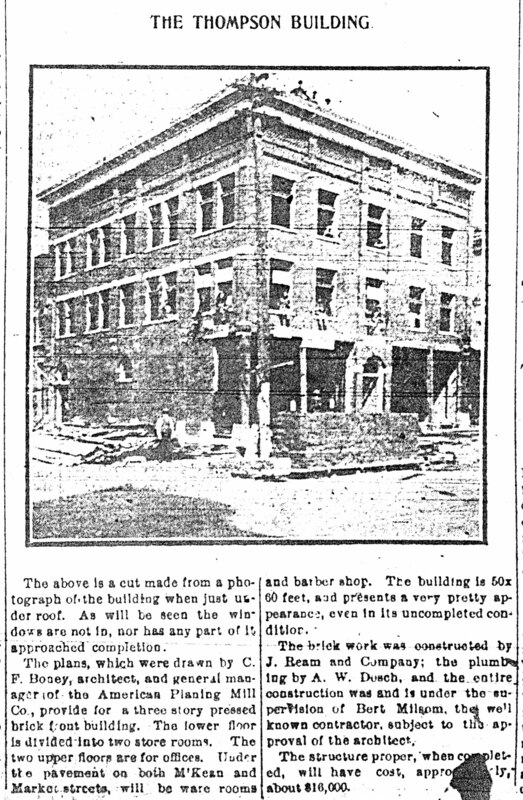 Here is an article published October 12, 1904, when the construction was nearly completed. The building replaced “The Daily Times” building which had burned on this location several weeks ago prior and occupied the spot for 20 years.The Daily Times was another newspaper from that era. Plans had called for possibly having 4 floors and the top floor was mentioned to be the home of the Elks. Also mentioned in the article, it is amazing how the basement extended out underneath the sidewalk area of which was the roof of these sections. I guess if you own the property clear till the street you used it all. I was able to observe this during a remodeling period a few years ago of the Thompson Building. Amazing what they accomplished in those days. 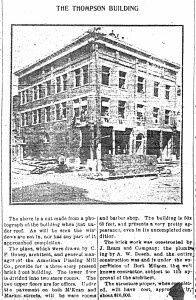 the left on N. Mckean St. was the Heilman building which was built before the turn of the century and appears to be well constructed. 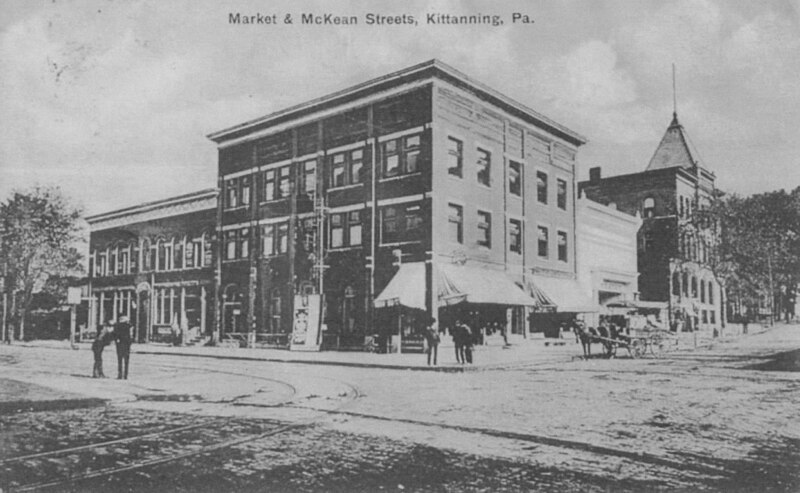 The trolley tracks made the turn as shown and it traveled down N. Mckean Street from the Trolley barn, which was located at the now Kittanning Cottages near Chestnut Street. It wouldn’t be long that the overhead elevated bridge would be constructed to bring patrons from Wick Boro to this location for one continuous trip to town. Most of the corner 1st floor were occupied by Drugs Stores throughout the years. It took a little investigating of what Sheplers meant in the lower portion of the building shown in the colored postcard above. 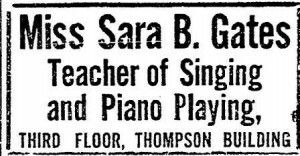 This advertisement was from 1908. 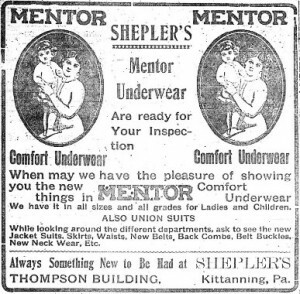 I discovered that in the next month L. H. Shepler was having a bankruptcy sale and to be retired. Some of this information can really help to date the photographs and the time era it was taken. Walter J. Strurgeon shown on the right side of the building was a pharmacist, possibly occupied a spot in the previous building. He is labeled on the post card in the east side of the building. Infield’s was in this same spot during the 40’s, another drug store. When Mr. Sgro last owned it, I believe it was posted as Gil’s on the west side during the late 70’s and 80’s and sat idle. But thankfully the building still survived. 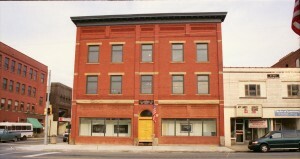 For years Fox & Stone occupied the 2nd floor with offices. Mostly handling Real Estate. 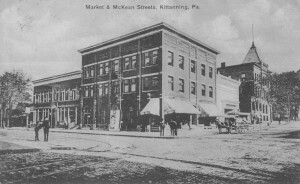 Several other entities used this corner building which was in the hub of downtown Kittanning Business. 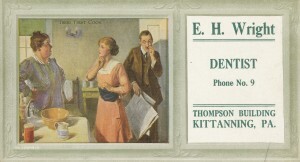 Some of the located advertisements who occupied the Thompson Building. For years the basement in this building served the area as a restaurant and bar. The last established was “The Pub”. Soon after Rosebud completed the restoration. 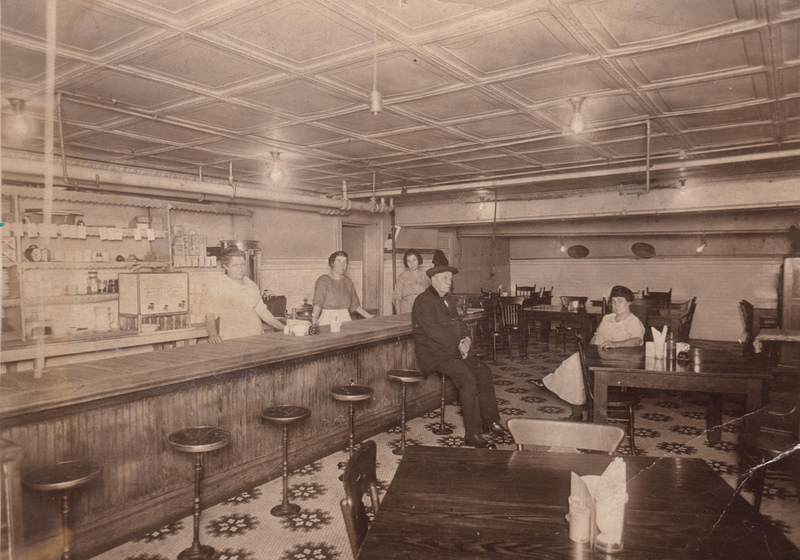 Love these articles on Kittanning …..esp. 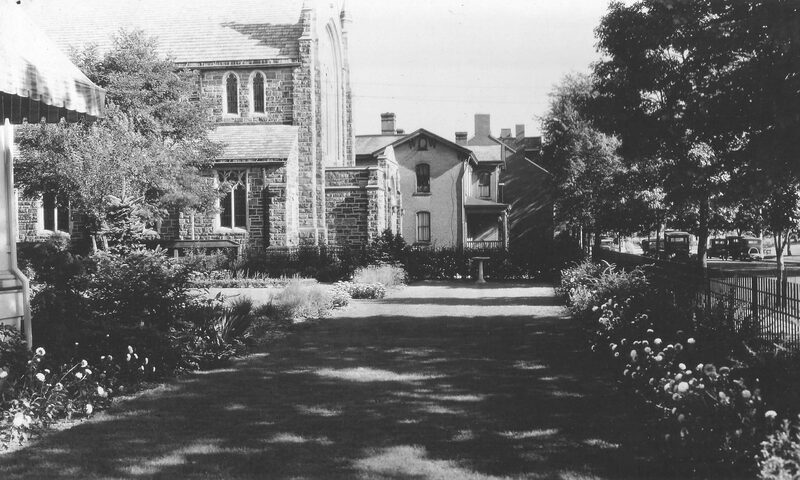 Regarding the buildings…..it was a big city to me when I was a child….going to “town” was fun. It’s a shame that the current generation will never get the Kittanning experience and why it means so much to us.